NOTICE: Make sure you have downloaded and installed the latest package from 2018-09-27 which fixes a crash related to P3D weapons. Aside numerous fixes, this update mainly brings a brand-new C++ SDK. For support reasons, this SDK is currently available only to Tacview Enterprise users. It may eventually become available to the public, but this will be for a later update. Now, this also means that the Lua SDK available to everyone has been improved! It offers an extended API so you can draw more things in the 3D view and better analyze the telemetry of active objects. Don’t forget that you can press CTRL+R to instantaneously reload your Lua scripts. Very handy for quick development! The documentation available in C:\Program Files (x86)\Tacview\AddOns\ has been updated. And more samples have been added for Lua as well as for C++ addons. Since the API is identical for both languages, you can grab ideas from any sample and almost just copy/paste the code in your own creation. If you need more API function, just let me know, I will be glad to add them to the next releases. 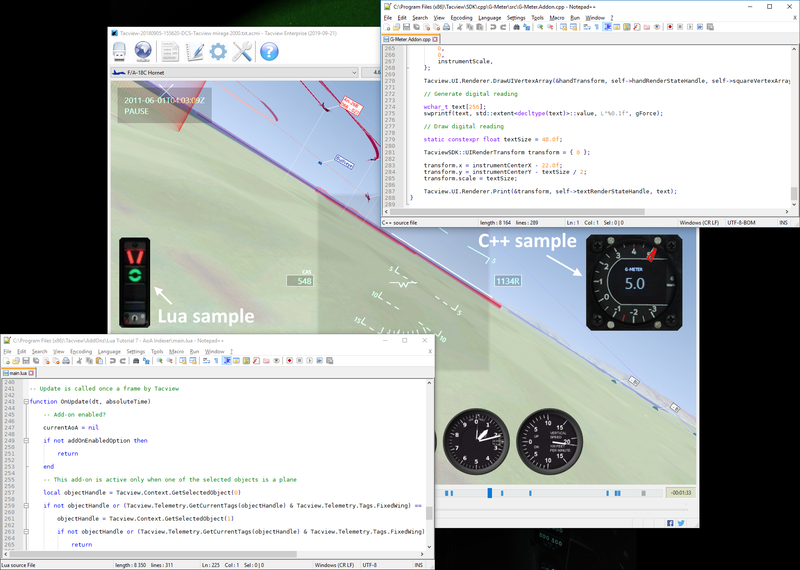 To close the loop, Tacview 1.7.4 will finally bring a C# SDK which will offer identical features as the Lua and C++ APIs. How to convert Falcon 4.0 coordinates in Tacview coordinates? How can I programmatically know where Tacview is installed on my system? Tacview 1.7.6 is now available! Holiday sale: 40% off on all Tacview licenses from Dec 21st to Jan 4th! Tacview 1.7.5 is now available! Tacview 1.7.4 is now available! Tacview 1.7.3 is now available! Mapview 1.4.1 from Jacques 'Detox' Deyrieux is now available! Tacview 1.7.2 is now available to everyone! Summer Sale from Jun 23rd to Jul 9th: 50% off all Tacview editions! IL-2 maps in Tacview 1.7.2 beta 2! Battle of Kuban is officially released! Tacview 1.7.0 is now available! Holiday sale: 40% off on all Tacview licenses!